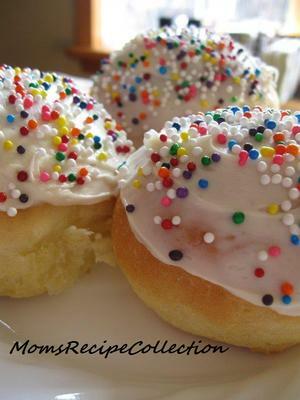 Love this recipe..My mom used to bake them in coffee tins...they were so yummy! It's Easter again and who can resist a paska bun??? Mix and add liquid ingredients. Add 4 c more flour. Add more if dough is very sticky..(I used 10 cups) Put in a greased bowl and cover and let rise 1 hr. in a warm place. Do not punch down. Form buns and put on pan and let rise 1 hr. Bake 350* until golden brown. I think you may have had to use a lot of extra flour because the total amount of water in the recipe is a bit much. You may want to cut it by half. Just my observation from how wet the recipe seemed when I tried it out. Hi Sohan, I wonder if perhaps the flour you used could have made a difference. It is different in different countries ... not sure where you live. This recipe's been made this way in Canada and the USA using about the 10 cups as Susan mentions in the recipe. How much flour did you have to use? Hi! I have made 2 batches to serve to friends here in Guatemala...this is very new to them. My heritage is German and Russian. This is a great recipe.....very light. This looks delicious! How do you pronounce Paska in German? I'm just starting to learn and want to say it correctly. Danke! The way my mom did it. My mom always made these in clean empty cans from corn, coffee. I imagine you could do the same with these. Can't remember her using fruit in it though. What do you use for the icing? Susan, this recipe sounds so easy and so good. I love the idea of using a blender to prepare the fruits and the first part of the recipe. Is it right by what I understand? You put the whole fruit in there, everything except the seed? The peel as well? Including the white part under the peel? Usually only the zest part is added, but if here, all except the seeds, then that's surely quick. The picture you included looks so yummy. Thanks for submitting this contest entry!